Sister M. Clarissa Theresa Mroz, C.S.F.N. 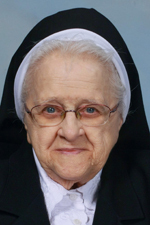 Sister M. Clarissa (Theresa) Mroz, C.S.F.N., died Dec. 15 at Nazareth Hospital in Philadelphia at the age of 90. She was in the 71st year of her religious life. Born to Josef and Rozalia (Mieloch) Mroz on Nov. 25, 1927 in the Port Richmond neighborhood of Philadelphia, she attended St. Adalbert School and Nazareth Academy High School. She entered the Sisters of the Holy Family of Nazareth in 1946 and professed final vows in 1954. She earned degrees in French, history, religious studies and library technology from Community College of Philadelphia, Holy Family University, Villanova University and St. Charles Seminary. Her first assignment was Holy Trinity School in Utica, N.Y. as a primary grade teacher. She spent many years in primary and secondary education as a teacher and administer in New York, Maryland and Pennsylvania. In 2002, she assumed responsibility as director of the library at Nazareth Academy High School and remained in that position until her retirement in 2012. The funeral Mass for Sister Clarissa was Dec. 20 at Mount Nazareth in Philadelphia. Donations in her memory may be made to Sisters of the Holy Family of Nazareth, 310 N. River Road, Des Plaines, IL 60016.